My name is Betty. I was born in Nigeria. I came to London when I was 16. It wasn’t easy coming to a new country on my own, but I had to grow up fast. I don’t like to call myself a victim. I am a survivor. The thing I found most difficult when I first came to London was realizing for the first time that I was different and that people looked at me differently here. I felt very alone. The first Christmas was the most lonely. I missed my family, especially my dad. I love to cook and I love to eat not just any food but good food. I feel alive when I see others enjoying my cooking. It is a form of therapy for me, I like to get my hands into something and cooking is the best way i can do that. Joining Migrateful is one of the most rewarding things I have done for a long time. I never thought I could ever have the confidence to cook in front of other people that weren’t my family. It’s great to meet other chefs that are in a similar situation to me, also experiencing the difficulty of the immigration process. I can be myself in this group and I really appreciate it. Nigerian cuisine has so many different dishes. We have lots of different tribes in Nigeria and different cultures and languages and so everyone has their own way of cooking. We celebrate every occasion with food – it’s a huge part of our culture. Cooking is something that Nigerian families always do together and recipes are passed on through generations. Sharing food with friends and family is really important to me and this is why I love Migrateful. 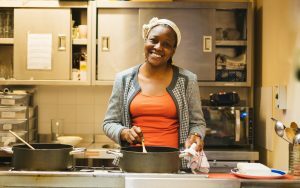 My name is Elizabeth, I’m a mother of three from the Western part of Nigeria and I love cooking. 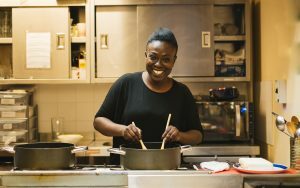 My passion for cooking started from when I was a young girl and carried all the way to boarding school and then at university until I got married. I was always finding excuses to rustle up something in the kitchen! From baking little treats to handling large cookings for family parties, I have found myself constantly cooking for friends and family. I have had years of volunteering at a weekly soup kitchen in the heart of Tottenham and much recently at Hackney Migrant Center. This passion brought me to Migrateful and the experience has been awesome. Not only do I get to learn various types of dishes but I also get to meet people from so many parts of the world! For someone who doesn’t travel around much like me, that’s the best part! I get to sneak a peak into all these countries… an absolute pleasure! Sharing my love for food is a really great way to feel a connexion with my roots, seeing the pleasure on people’s faces when they eat my food is the icing on top of the cake!